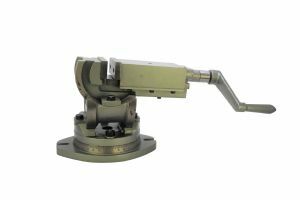 Tilts in 2 axes (0-90 degrees in one axis, 45-0-45 degrees in the other) and swivels 360 degrees on the base making it ideal for complex grinding, milling and drilling operations. This superb precision vice is made from close grained high tensile seasoned cast iron. Fully hardened & ground tool steel jaws. Swivel Base is graduated 360 Degrees, in 1 Degree increment, so that vice can be set at any working angle in Y axis.